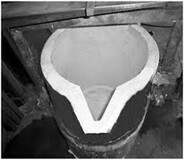 Refractory castable and repairing cement, high alumina based. 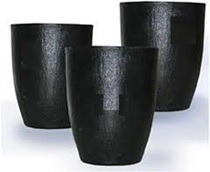 Alumina based clay bonded or phosphate bonded plastic refractories for induction furnace spouts and top rings. 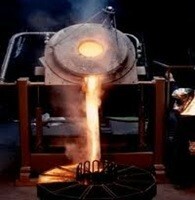 Exothermic drossing flux for aluminium alloys. Cleaning flux for aluminium alloys. 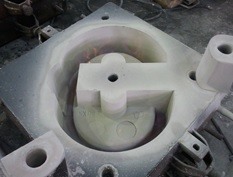 Removes Aluminium oxides inclusions from the melt. Flux for metal recovery from the slag. Flux for cleaning the walls of reverberatory furnaces. Removes the oxide buildup. 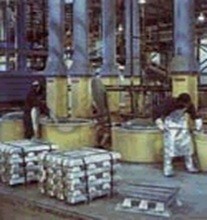 Covering and protection flux for melting fine scrap and drosses in rotary furnaces. 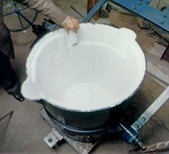 Degassing tablets for the removal of disolved gas inclusions within the molten metal and the prevention of pores creation in the casting. ΤiB based tablets for grain refinement. Improves the mechanical properties of the metal. • The addition of Na in Al/Si alloys modifies the grain structure and improves the mechanical properties of the castings by 20-25%. Dilute in water and apply by spraying. Very good insulation for large thin surfaces.